In an empty gesture, the World Boxing Council has ordered a rematch between Saul “Canelo” Alvarez (49-1-2, 34 KOs) and IBF/IBO/WBA/WBC middleweight champion Gennady “GGG” Golovkin (37-0-1, 33 KOs). It’s unclear why the WBC even bothered to do this, as Canelo didn’t fight for their belt in his contest with Triple G on September 16 last month at the T-Mobile Arena in Las Vegas, Nevada. The WBC ordering the rematch isn’t going to put pressure on the 27-year-old Canelo to make the fight with the 35-year-old Golovkin in a timely fashion if it’s not in his best interest to make the second fight right now. The options for the WBC are rather limited if Canelo decides he’s not going to comply with the WBC ordering the rematch with GGG. I don’t know what the WBC can do if Canelo ignores them. The only thing I can think of the WBC possibly doing to hurt Canelo is if he ignores them, they could potentially order Golovkin to face his mandatory challenger Jermall Charlo. Golovkin doesn’t want to give up his WBC middleweight title, so he might opt to take that fight if the sanctioning body ordered the negotiations with Charlo to start quickly. One of Canelo’s promoters Bernard Hopkins said this past weekend that there will definitely be a rematch between Canelo and Triple G.
Golovkin and Canelo fought to a 12-round draw in their fight on September 16 at the T-Mobile Arena in Las Vegas. The fight was televised on HBO pay-per-view. The draw shook up the boxing world, because most fans saw Golovkin winning the fight by the scores 116-112. Some fans saw it a little closer than that with Golovkin winning 115-113, but overall, it was a rather easy fight to pick the winner. 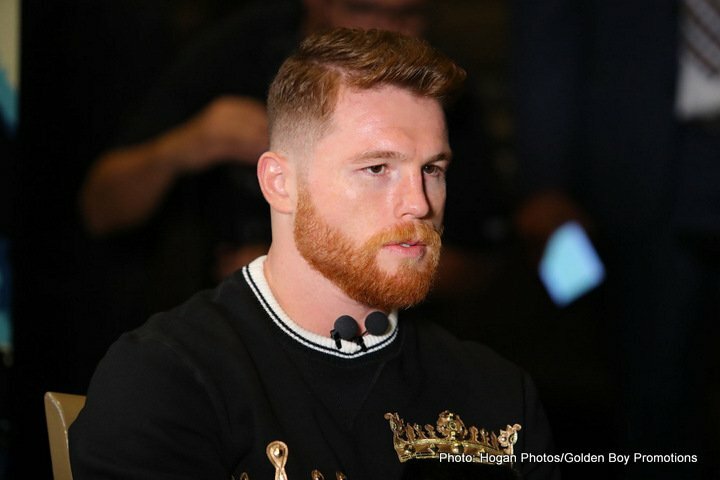 Canelo feels that he was the one that deserved the win in the fight, even though he was roundly booed by the boxing fans at the T-Mobile Arena immediately after the results of the fight were announced. Canelo said after the fight that Golovkin doesn’t hit hard like what they say he does. Golovkin was mostly using his jab to pick a tired-looking Canelo apart on the ropes in rounds 4-12. If Canelo chooses to fight someone else in his next fight on May 5 next year, it could possibly be fellow Golden Boy Promotions fighter David Lemieux. Canelo-Lemieux would be an option if Lemieux doesn’t face Miguel Cotto on December 2 in New York. Lemieux is an option for Cotto in what is supposed to be his final fight of his boxing career. It’s in Canelo’s best interest to make the rematch with Golovkin. After Canelo and GGG get done facing each other, Canelo is going to be pressured to fight the likes of Daniel Jacobs, Jermall Charlo and Sergiy Derevyanchenko. Each of those fighters have the talent to give Canelo just as many problems as Golovkin and maybe even more. None of those fighters would be content with just jabbing Canelo for 12 rounds like Golovkin did. They would go after him, force him to work harder than his heavily built physique would let him.